2. Catering units position over Malda Division. 3.Parcel Space Leasing over Malda Division. 4. Commercial Plot position over Malda Division. 5. Commercial Publicity over Malda Division. 6. ATM over Malda division. 7. Enquiry facility over Malda Division. 8. Goods shed & Siding position over Malda Division. 9. Halt Position over Malda Division. 10. Latest Parking Position over Malda Division. 11. Pay & Use toilet position over Malda Division. 12. Retiring Room & Dormitories position over Malda Division. 13. TMS position over Malda Division. 14. ( A)Trains of Malda Division (Mail/Exp.) (B) Trains of Malda Division (Passenger). 16. Vending stall over Malda Division. 17. Weigh Bridges over Malda DIvision. 18. WAIVAL POSITION OF DEMURRAGE/WHARFAGE CHARGES. 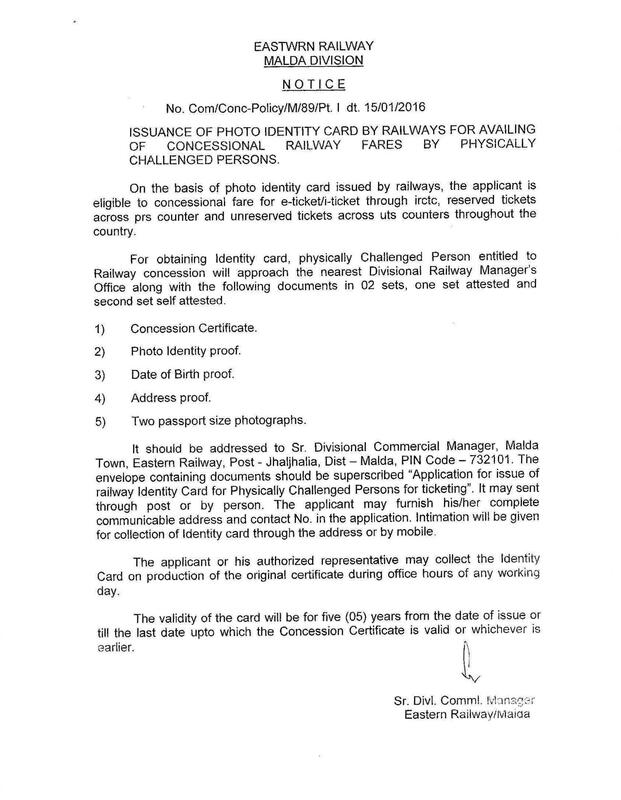 ISSUANCE OF PHOTO ID CARD BY RLY. 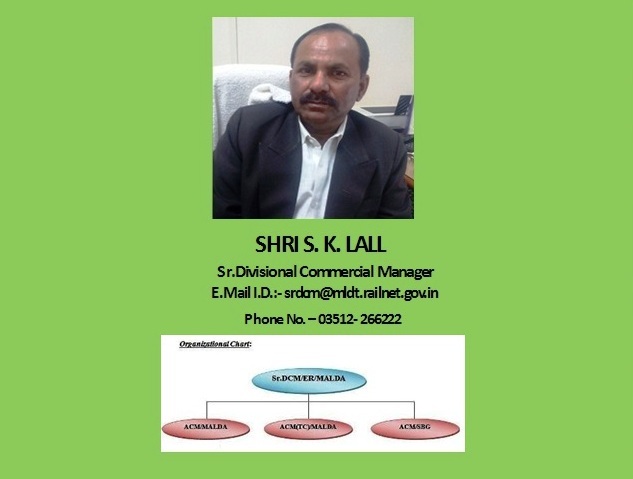 FOR AVAILING OF CONCESSIONAL RLY. FARES BY PHYSICALLY CHALLENGED PERSONS. 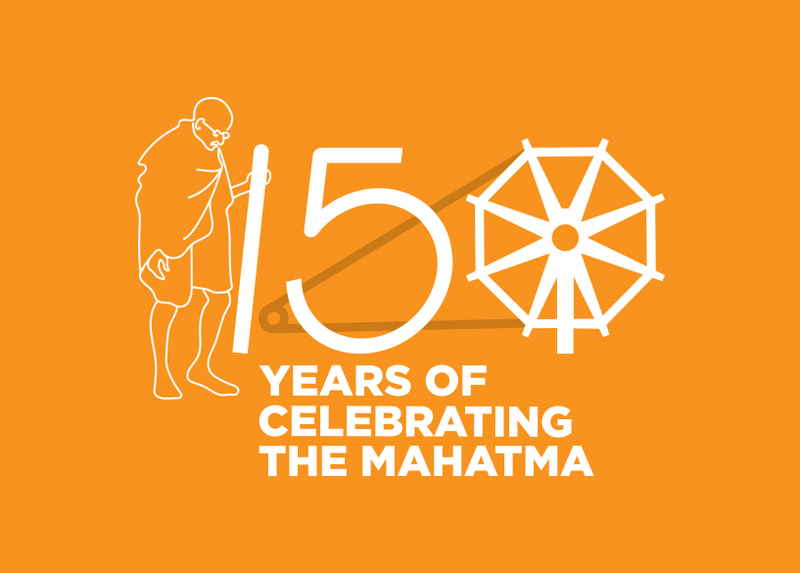 CoTVM AT MALDA,BHAGALPUR AND JAMALPUR. A SMART WAY TO PURCHASING UNRESERVED RAILWAY TICKET.